When it comes to food addiction, I firmly stand in Marion Nestle’s “mostly skeptical” camp. One of the most eye-rolling components of these articles is that the foods referred to as “high-fat and high-calorie” are your usual suspects: cheesecake, frosting, sausage, bacon, etc. Let’s not forget, though, that there are plenty of healthy and nutritious high-fat, high-calorie foods: coconut, almonds, cashews, pecans, walnuts, salmon, avocado, etc. I have yet to hear someone who claims bacon is addictive also tell me they have a hard time saying no to an extra ounce of pecans, or that they find themselves gorging on salmon steaks. Many of these foods, by the way, are not simply high in fat — they are also high in added sugars. 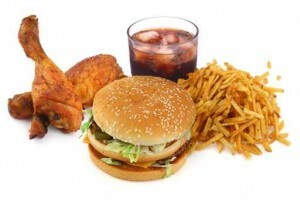 So, why is fat being singled out as the “addictive” nutrient? “[Researchers] studied three groups of lab rats for 40 days. One of the groups was fed regular rat food. A second was fed bacon, sausage, cheesecake, frosting, and other fattening, high-calorie foods–but only for one hour each day. The third group was allowed to pig out on the unhealthy foods for up to 23 hours a day. The rats in the third group gradually developed a tolerance to the pleasure the food gave them and had to eat more to experience a high. They began to eat compulsively, to the point where they continued to do so in the face of pain. When the researchers applied an electric shock to the rats’ feet in the presence of the food, the rats in the first two groups were frightened away from eating. But the obese rats were not. My main issue with these studies is that they truly leave me with a “so what?” feeling. I have a very difficult time making parallels to human behavior. Am I supposed to believe that an obese individual who is physically addicted (which is very different from emotionally addicted, which, to me, is significantly more credible) to junk food will continue to wolf down bags of Doritos while bleeding from a shotgun wound? Additionally, if the group of rats that developed this food addiction were able to binge up to 23 hours a day on a very small number of foods, how is that applicable to the human experience? Something else to ponder: all of these foods existed — and were consumed — long before obesity rates skyrocketed. Thank you to Claudia Zapata, MS, RD, for tweeting the CNN article. You can follow her at @ClaudiaZapata. The study makes reference to rats continuing their unhealthy binges even after enduring uncomfortable amounts of electricity applied to their feet. So, am I supposed to assume, then, that a human being who is “addicted” to Twinkies will continue to eat them even while under severe physical pain (whereas someone who does not eat junk food will not eat anything while enduring that same amount of physical pain)? True, physical pain doesn’t always stop addiction, but that mainly applies to alcohol and drugs. Well having read The End of Overeating I don’t think that author, who definitely refers to those studies, leaves out the emotional aspect of people’s addiction but rather uses the study to help others realize that there is also a possible physical addiction aspect. The books author also explicitly blames food companies for tweaking their sugar, salt and fat in their processed foods and layering it to make it that much more “addictive” to people. He also seems to think that what processed food makers are doing to people is akin to what the tobacco companies were doing in shilling an addictive product and that it should be seen that way by the government and possibly addressed with similar tactics. I found the book interesting and helpful. I haven’t read this study, but does it really claim there is a PHYSIOLOGICAL addiction to these types of foods? Because I have yet to see anybody go through actual withdrawal syndrome when they didn’t get their fast food fix. That being said, my read of these studies has always been that these foods (which contain not only fat, but specific kinds of fatty acids along with sugar) do make us feel pleasurable, but don’t addict us in the same way as nicotine or opiates. Instead, some become dependent on the FEELING the food elicits, much in the same way marijuana smokers become dependent on getting high without meeting the criteria for actual physical addiction as defined by the medical community. I think this is quite likely, actually. By paralleling food to cocaine and nicotine, the study is making quite a powerful statement, and points to a physiological addiction… which, as you read, I do not agree with.